What do we really know about young people’s mental health? We know it’s a big issue. Around 1 in 10 young people have experienced a mental health difficulty. Around 75% of people with a mental health problem start developing it before the age of 181. Only 1 in 4 young people actually get the help they need after being referred to services, and many don’t seek help in the early phases when difficulties start to emerge. Youth mental health is getting more attention – for example the Sunday Times newspaper has an ongoing Young Minds campaign. This is all positive for raising awareness of the significance of the issue. Despite this, our understanding of young people’s mental health has huge gaps. One young person I spoke to likened it to listening to a nearly blank record with a few seconds of sound here and there. We don’t have a good idea of why young people experience mental health problems. Worse we don’t really know the best way to help young people when they do. This needs to change. We need more investment in support for young people. We need to promote emotional wellbeing and good mental health in schools, and elsewhere. We need to better understand the impact of physical health problems on mental health. But to address any of these issues we need more research, otherwise we will continue to blunder in the dark. And, we need research that will truly address what’s most important to young people by involving them. As part of this effort, we have just launched a new initiative. The right people to ask the right questions about young people’s mental health. 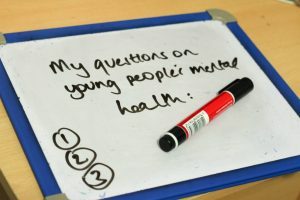 We are following a way of working that was developed by the James Lind Alliance, which brings together different experts: service users, parents, guardians, clinicians, and researchers to produce a survey and then prioritise the resulting questions the public have about young people’s mental health. We have called the project “Right People, Right Questions” and it is overseen by a steering group made up of young people, parents, researchers, clinicians, and funders. We need your help to make it a success! 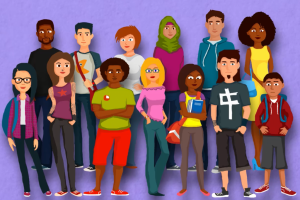 Take part in our national survey entitled Right People, Right Questions, giving everyone interested in young people’s mental health the chance to tell us what they want answers to from new research. We are specifically looking at questions relating to young people aged 11-25. It only takes 10 minutes to complete! We also hope you will share the survey with your contacts. One thing we have put a lot of care and attention into is involving young people in the developing of Right People, Right Questions. We have a young people’s advisory group with 10 members, and a virtual network of nearly 100 other young people. They have written and developed a video which will be launched shortly together about the project. It’s been fantastic working with them all and they will be staying involved as we progress with Right People, Right Questions. The result of the survey will be a list of the pressing research questions, which will be shared with funders and research teams so that future projects target these priorities. To use the record analogy, if the blanks in our knowledge really are so great then prioritising what we look at is a very important first step. There simply isn’t enough money available to fund all the research that needs to happen all at once. Whilst the project is led by the McPin Foundation we have been fortunate to have received funding support from range of organisations: MQ, The Charlie Waller Memorial Trust, The Matthew Elvidge Trust, and Mental Health Research UK. As well as this we have the support of a much wider network of organisations. There is more detail about the partners and how the process works on our website. So your call is action is clear. Please do fill in the survey. Share it with other people you know. If you have an enquiry about the project, our project co-ordinator Lauren Evans would be pleased to hear from you. Finally, you can also show your support by following us on Twitter, Facebook and Instagram @youngpeopleMHQ.